As a mom, I’m conscious of my kids time on their tablets or devices. I think about #screentime and try to make sure we have a good balance of both device time and outside play. We have even figured out ways to use our tech toys beyond the typical games and use them for education, role play and fun. Ideas to Enjoy Bluebee Pals Beyond the Screen! 1) Have a tea party with your favorite Bluebee Pal – now that they are weighted you can even place them in a chair and they will sit. 3) Bluebee Pals make great friends talk to. Encourage your child to sit and read with your Bluebee Pal turned off. This time of year especially we enjoy sitting and reading books at night. I encourage my son to help turn pages, count and he loves snuggling with Parker. 4) Play dress up. Dress up your Bluebee Pal in your favorite costume, shirt or clothing that your child may be wearing or have outgrown. My son loves fitting Bluebee into sweaters (3T or larger) works best. 5) Hide and seek – hide your child’s toys around the house. Have them play hide and seek to find them. When my son finds an object I have him tell me what it is, what color is it and place it in a basket. This is a great game for babies, toddlers and preschoolers and can be modified based on age. 6) Play musical chairs stuffed animal style – turn on some music and pair your Bluebee and then move around the stuffed animals until the music stops. 7) Play freeze dance – this is a great activity that can be done both inside and out and is a great way to get energy out. Kids dance to their Bluebee Pal with music and when the music stops they freeze! 8) Make an obstacle course for those chilly or snowy days when you can’t spend much time outside. Use couch cushions to make pillows, stomp your feet, clap your hands. Get your Bluebee involved too! 9) Cleaning up toys – my kids hate to clean up their toys after they play. We make it a game complete with music (the Cleanup song) and baskets to put the items in. We set a timer for 30 seconds and see who can clean up the most toys. I hope these tips are helpful to you in thinking about ways to get kids active, having fun and playing all at the same time. Adding in Bluebee gives it that fun extra reward! Bluebee Pals app by Kayle Concepts LLC is a universal app for iOS and Android. As many of you know, I have been part of The iMums for a really long time! I’m pleased to note, that I had a chance to help design this app. The app brings BlueBee Pals to life using an app which teaches life skills such as; bathing, tooth brushing, washing hands, bedtime routines, as well as a kitchen which encourages your child to feed Bluebee a variety of meals and snacks. The app uses scaffolded learning, the first mini game is generally easier and for younger children – if you tap the arrow at the bottom you are given a more complex game for example, lining up your ABC’s turns into sight words. In the ice cream mini game, first you find the Bluebee Pals and then you have to match them to the appropriate beach chairs. You can learn more about the app on the Bluebee Pals website. This review was originally published at The iMums. NOTE: I was involved in the design of this app. Todo Telling Time is a learning and interactive app for children K-2 that helps facilitate learning of time concepts. This educational app is also very functional because it relates to the everyday concepts and also helps target various aspect of time. With this app, children will learn to tell time to the hour and minute, calendar concepts, digital time, and the parts of a daily schedule. With this app, your child can also practice placing numbers around a clock face, counting by 5s, and learning estimation. Todo Telling Time contains six multi-level mini-games. The games include learning days and weeks in order, putting numbers in order and learning number orientation on a Ferris wheel, learning about the timing and order of a schedule, learning time with a train game, building short-term memory and sequencing skills in a memory game and a quiz that assesses your child’s knowledge of time. Connect your Bluebee Pal. Choose from the six interactive games below. With Day the Weeks game, your child or student will be placing the days, months and numbers in order on a calendar. Let Bluebee reinforce the sequencing by saying the name of the day, month or number on the calendar. With the calendar game, your child or student can learn about time and schedules. It’s 8:00 am, time for school! After your child places the hand on the right location, Bluebee Pal will tell you what time it is! WIth the train game, your child or student or will learn digital time and Bluebee Pal will reinforce the time by repeating the correct time. With the memory game, the challenge is the find the number that was called out and shown to you briefly. Forget the number? Activate the rewind icon and Bluebee Pal will say it again! With the timed quiz at the end of the game, your child or student will be challenged with questions asked by Bluebee Pal such as “It’s 7:00 pm. How much time until 12:00 am?”. The time quiz gives you three choices that you can choose from. Who doesn’t love spending time with their grandparents? This fun zoo themed app is sure to delight and had my son learning animal names, spelling and math and he learned about a new animal each time that he played. 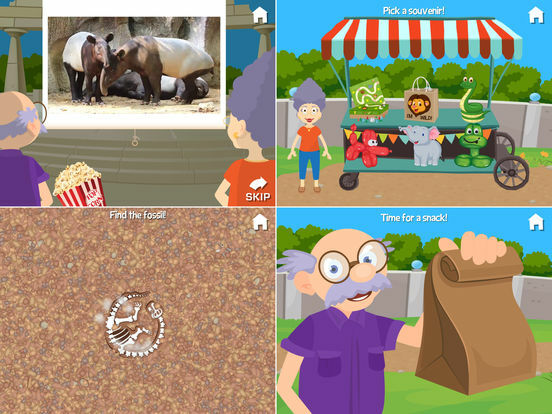 At the Zoo With Grandma and Grandpa App by Fairlady Media is not your traditional go to the zoo and see the animals type of app. In fact it’s much more fun and educational! The app features 8 mini games which you plan along as you meet new animals – some that my older son had never even seen at the zoo. You also practice matching, addition, puzzles and more! This is the 10th app by Fairlady Media and the first that features both Grandma and Grandpa as central characters within the app. The app features over 50 animals from around the world and is designed for elementary aged children. 1) Animal Sounds: What animal sound do you hear behind the curtain? Pick one from an assortment of 3. 2) Fix the sign: Use the letters to fix the sign – it must be in the correct spelling order, you move the letters at the bottom to match the letters on the sign and has a zoo themed twist using types of animals. 3) Spot the Difference: Which fish in the aquarium is different? Tap to choose the right one and see what might be different about it as well as the name. 4) Tram Math: How many people are on the tram. You can either finger tap count or see that each car has a certain number in it to solve the problem. 5) Jigsaw Puzzle: Put together the pieces of an animal and learn about them. Does the animal live on the ground or in a tree? What is it called? 6) Fossil Dig: Who doesn’t love getting dirty?!? Use your finger to help find the fossil and don’t get dirty in real life! 7) Match the sign to the animal: Using your eagle eyes, determine which sign goes with each animal type. I loved that the animals in this game were both ones we knew like alligator and other times a Tasmanian devil! 8) Feed the Penguins: Move the penguins to find the fish and feed them. 3) Move the seal to balance the ball on his nose. How long can you keep it in the air? 4) What trip to the zoo is complete without picking out a souvenir to store and play with in your toy box? I loved that this app introduced my son to new animals especially ones that were not traditional at the various zoos that we have visited around the country. Having a variety of animals and games made the app fun and interactive. We also really liked that both Grandma and Grandpa participated in the app – this was fun because we usually only see one or the other. The graphics are fantastic and clear and my son learned something about a new animal each time that he played meaning that he kept playing to keep learning – a huge win! One enhancement I would like to see is “animal facts” – perhaps you could add in cards at the end of the app that you earned with facts about some of the more unusual animals like the Tasmanian devil which would include a photo, animal sound and a fact or two about them. My son also loved being creative and “drawing the stripes” aka decorating the animals with crayons and asked if there could be a game where you draw the spots on the animal or stripes on a tiger within specific lines. My son also asked if we could feed the animals to learn more about them as well – we recently learned that a turtle at the aquarium liked brussel sprouts which encouraged my son to at least touch them! There is no external advertising or in-app purchases beyond Fairlady advertising their own apps. Internet access is not required to play the app. External links are protected with a parental gate which requires your year of birth. You can access the settings and turn on and off the games depending on your child’s ability level which allows you to target specific skills or make it easier for younger kids. You can also turn on and off the music. Overall, this is a fun zoo themed app that introduced my son to some exotic animals we had never seen before. My son enjoyed playing the app over and over again and learned something new each time if it was an animal or perhaps how to spell an animal name. Huge amount of replay value and the app can target younger or older kids depending on the options you choose for the mini games. We paired Riley the Zebra for purposes of this review. Having my toddler play with the app made him laugh since he was a zoo animal! This is a great app to introduce children to a farmyard scene and animals. You may even find yourself singing along to the Old MacDonald song! Old MacDonald by Loeschware features an interactive farm where children spin an animal wheel to select various animals to put on the farm. The company was founded by a brother and sister who have designed all of the music and artwork for the apps. If children select the right animal such as a cow, they are rewarded with the cow piece which they then put into the barn. If they select the wrong animal such as a fox or an octopus one of four actions happens to help them remove the wrong animal from the farm. They range from a tractor removing the errant animal to a puff of clouds. 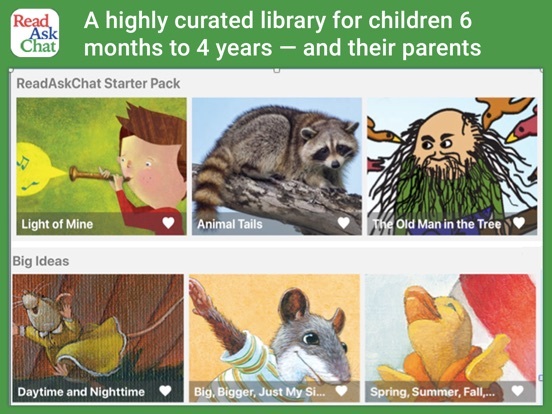 The app is primarily designed for toddlers and early preschoolers. It provides audio cues and music designed to engage players throughout the game. The app helps children practice spacial awareness, improve attention span, as well as practice fine motor skills and matching. My toddler loved this app especially when we paired Leo the Lion – he thought it was hilarious to hear him make all the different animal sounds. I found myself singing the catchy song as we played along too! I liked the various animals that the game included – my son’s personal favorite was the duck. We also really enjoyed spinning the wheel to pick the appropriate animals and liked the fact that as you picked each animal it had a checkmark on it. The musical elements as well as the art in the app are fun and encourage children to sing along. I also thought the fact that the place where the appropriate animal was supposed to be placed was helpful, I can see this being really good for young children who may have trouble matching with the spot on the page. I wish that the Old MacDonald song would be repeated with the names of all the animals after you have completed the puzzle. After finishing it, I would have also liked the ability to touch each of the animals, it finishes up rather quickly, so prior to dropping the last puzzle piece I usually do this step with my son. In addition, if a wrong animal is picked, I would have liked the action to vary a bit. My son picked the wrong animal twice in a row and the animal was kicked by the donkey each of the times rather than changing to a different action. This is a great app to introduce children to a farmyard scene and animals. You may even find yourself singing along to the Old MacDonald song! Other apps by this developer include My ABC Train, Five Little Monkeys, and Big Top Circus. This app is currently part of an Apple handpicked selection for the “App Store Essentials: Apps for Toddlers”. This post was originally posted at The iMums – it has been slightly edited for content. One of the most important things for preschoolers is to learn about the world. Using apps from My Playhome allows kids to experience every day events that are common in a child’s life and role play with them. This suite of apps includes a typical home, a series of stores in My Playhome Stores, My Playhome School and MyPlayhome hospital. Kids can drive an ambulance, shop for clothing or even play school with this fun series of apps that will keep them engaged for hours. The apps work with one another – so you can buy one or all – and switch within them to the next app. These apps feature no advertising or in-app purchases. Shimon Young is a genius. Shimon is the developer of the universal My PlayHome app and has managed to find a way to keep my iToddler (2.5) entertained for more than just a few minutes. Not an easy task. My PlayHome brings the dollhouse into the digital age by offering an entire virtual home, complete with an adorable family of five that kids can explore and interact with. Also available on the iPhone (Pocket PlayHome! ), this app features beautiful hand-drawn illustrations and realistic sounds associated with each interaction. My PlayHome also has a simple user interface very easy for little fingers to control. This app caters for 2-8 year olds which is appropriate as it’s simple enough for the younger users to play with yet detailed enough to keep the older kids entertained too.” Quite a comprehensive app but still very easy to use by its intended audience. One of the best kids apps I have come across on the App Store!” This continues to be a top pick of The iMums for kids of all ages. Read the full review. Buy the app here. When iMum Amanda reviewed the original My PlayHome back in 2011 she described it’s creator Shimon Young as a genius, and I have to agree. After being installed on our iPads for 2 1/2 years my kids still play with My PlayHome regularly, and there are very few apps that retain their appeal long term like that. When I told my children there was a new My PlayHome app out, to say they were excited is a definite understatement. My PlayHome brings the dolls house into the digital age with an entire interactive house and garden to play in, and My PlayHome Stores expands the play by adding four shops to explore and shop in. The app stars the same characters as the original app – there are 3 moms, 3 dads, 3 girls, 3 boys and 3 babies from a variety of ethnicities and you can mix and match them any way you like to create the family in the app. The twist that my children really love (and that I have not seen in any other app) is when the family go shopping in the stores they can walk home with their purchases, and if you own My PlayHome they can take their purchases from the stores back to their home. Read the full review. In the fantastic tradition of the Playhome Software Company, comes the latest My Playhome app, My Playhome Hospital. Fully integrated with the other My Playhome apps (Home, School and Store), this new app allows the player to explore all aspects of the hospital experience. When the app is opened, the child is faced with the view of the hospital and an ambulance. No settings tab, no external options, and no parental tab. The only extra button to press is the Tidy the Hospital wheel, which is a great option. It allows the player to actually erase the previous designs created and start fresh. The home page ambulance can be driven to the school, home or store; linking the other apps (one of my favorite features). An interactive app that familiarizes children with the workings and people in the hospital setting. Multiple different scenes with many opportunities to interact with the objects and characters on each page. Buy the app here. One of the best loved toys of all time are doll houses. It brings hours upon hours of enjoyment to boys and girls alike, and it’s only limitation is a child’s imagination. My PlayHome Software Ltd has brought this enjoyment in the most portable form possible in My PlayHome, My PlayHome Stores, and very recently, My PlayHome School. While my children and I enjoyed My PlayHome and My PlayHome Stores, My PlayHome School far exceeded our expectations. It has almost everything you could find in an elementary school: a receptionist desk, the principal’s office, a cafeteria, boys and girls restrooms, a science lab, an auditorium, a janitor’s closet, lockers, and of course, classrooms. Read the full review. Buy the app here. This post was originally posted at The iMums in August 2017. Grandma’s Preschool by Fairlady Media for iOS reminds me of the preschool I used to attend as a little girl. There are lots of great activities (more than 20) and opportunities to try out new things like coloring, playing outside, using toys, practicing early academic skills like letters and numbers, having a snack, taking care of a class pet and playing with others. There are three primary characters in the app and after you get off the school bus you go into the preschool classroom. This is a great app for practicing the routine of school which involves getting off a bus, selecting different activities in a preschool setting such as coloring or painting centers as well as having fun in a bright cheery environment. Read our full review. MTA Animals by My Toddlers App, LLC is a iPad only app that includes over 40 animal photographs designed to teach your toddler or children about animals. The animals range from cats and dogs to whales and elephants using real photographs. It is designed for preschool aged children and teaches image recognition as well as early spelling. Read our full review.